Over the last several years, the national retail pendulum has swung precariously toward e-commerce and away from traditional brick-and-mortar shopping. In fact, The Atlantic reported last year that from 2010 through 2016, Amazon’s online sales in North America quintupled from $16 billion to $80 billion. Fortunately, the business outlook in Estero does not mirror the national profile. 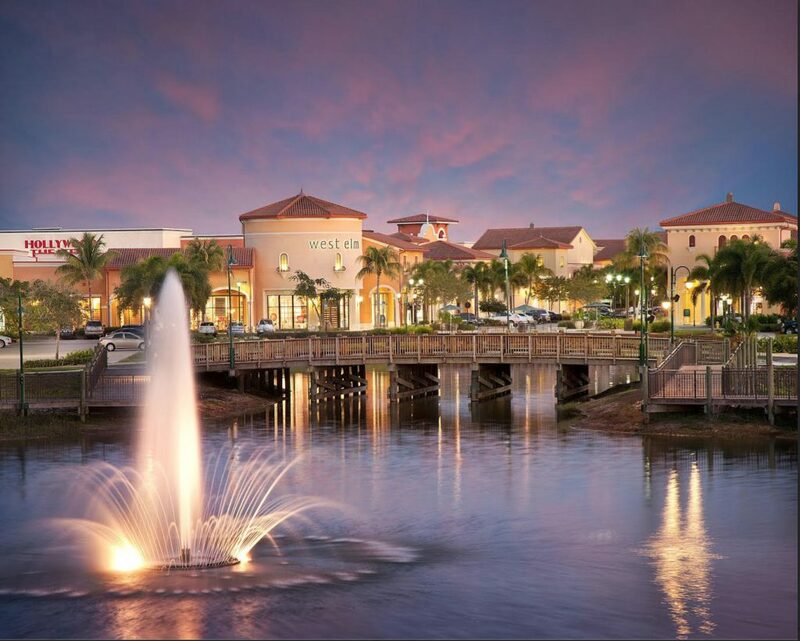 Since the turn of the century Estero has become the retail center of Southwest Florida with two major regional shopping centers, Coconut Point and Miromar Outlets, each with over 130 stores. In fact Estero is home to fourteen (14) existing or planned Shopping Centers. The focus of this article is on the two regional centers and four conventional Shopping Centers that have experienced considerable investment or are seeking Village approval for substantial project development. Four of the other eight Shopping Centers are completely built out and fully occupied; one has several unoccupied outlots and the other three are still vacant and may be developed for other purposes since Estero already has so many retail offerings. 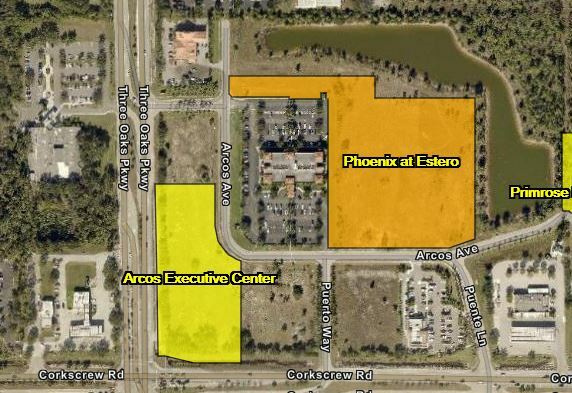 A market study completed for ECCL five years ago found that 60% of Estero’s retail sales were to non-Estero residents. Commercial building, mostly retail, in Estero expanded from 500,000 to 4.5 million square feet between 2000 and 2008 after the community’s residential building boom ended and the “Great Recession” terminated almost all building here and throughout the nation. Because of the recession, many Shopping Center developments included only a few stores with the remaining property remaining vacant for almost a decade until a new surge began about two years ago. The retail component of Coconut Point, the Coconut Point Town Center, was constructed and about 80% occupied between 2003 and 2005. The remaining two-thirds of Coconut Point, about 330 acres, ranging from Hertz on the north to American House on the south, benefits from the strength of the shopping center and vice versa. There have been or soon will be ten major development projects in Coconut Point during the present growth spurt that began in about January 2017. Seven of the 10 investments have been shopping center projects. Five of the projects are new stores filling vacant spaces. They are: large Total Wine and Tuesday Morning stores and smaller Altar’d State, Burgerim and Duck Donuts stores. The other two major retail developments are new freestanding stores built on vacant outlots in the Town Center for Bassett Furniture and City Mattress. the 163,000 square foot Lee Health Coconut Point “everything but a hospital” diversified healthy living and healthcare facility with a 24/7 hour emergency department. Miromar Outlets Mall was built and one-third occupied between 2000 and 2004. It is now three times as large now as it was in 2004 with over 130 stores, restaurants and entertainment venues. During the present growth spurt Miromar has begun to transition to a more diversified client base, like many shopping centers nationally, with more of a focus on restaurants and entertainment. Four of the eight new investments are restaurants: Mr Pretzels, Brunch Bar & Patio, Wasabi Japanese Steak House & Sushi Lounge and Fusion 212 while the fifth is Amazing Things, – a 5D theater with special effects like wind, mist, moving seats, etc. The other three additions are H&M, Francesca’s and a soon to be added Miromar Outlets Hotel. 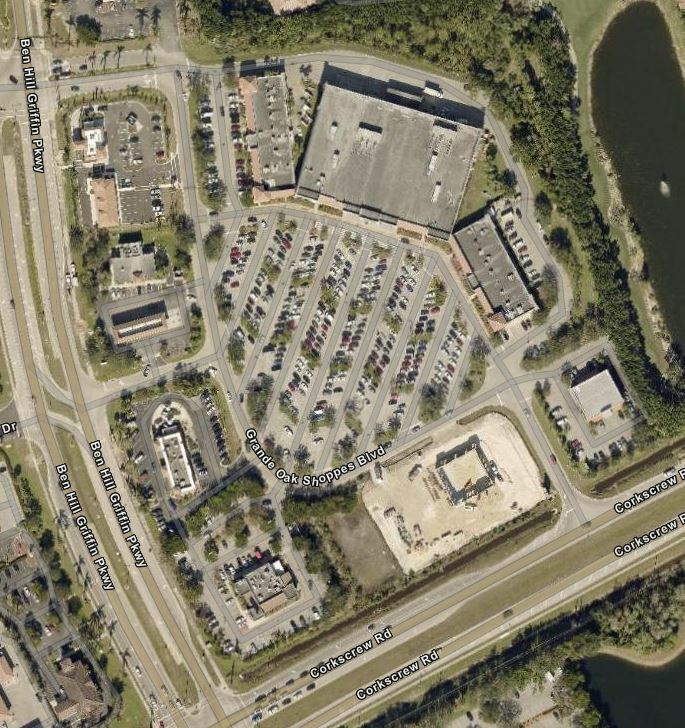 Estero Interstate Commerce Park was started in the mid-2000s anchored by a large Embassy Suites hotel supplemented by a few stores and lots of room for further development. Recently the owner got creative and sold three adjacent outlots to a developer who built about 200 rental apartments on property immediately adjacent to the southbound exit ramp from I-75. Now that the market has gown even stronger two major developments have nearly completed the development approval process: a Spring Hill Suites Hotel with over 100 room immediately adjacent to the Embassy Suites and a sizeable Primrose Schools of Estero preschool located just west of the Spring Hill Suites Hotel. These projects will bring this development to within 20% of completion. Plaza del Sol was also started in the mid-2000s occupied solely by a car wash and one of Estero’s first urgent care facilities and medical offices and several vacant development sites. These sites utilized only about one-fourth of the land in Plaza del Sol…the remaining three-quarters has remained vacant now for nearly a decade. Since this growth spurt began about 18 months ago, three significant projects have sought approval to develop in Plaza del Sol. The first and smallest of the three, Estero Veterinary, has been approved for development on a single outlot along Three Oaks Parkway. The second project, the Arcos Executive Center is a three story office building situated on three outlots at the corner of Three Oaks Parkway and Corkscrew Road. When completed this will be the first office building constructed in Estero since the Hertz headquarter building was constructed three years ago. The third project, Phoenix of Estero, is a diversified 140 unit senior housing facility, including independent living, assisted living and memory care units, on over 7 acres around the lake at the rear of the Plaza del Sol property. When these projects are completed Plaza de Sol will be over 80% complete with only a few outlots along Corkscrew Road to be developed. University Highland is a large 200 acre property that is in a most desirable location for any use, including retail. Years ago University Highlands was considered a good location for a University Laboratory School, a high school that explores innovative K-12 teaching approaches and later as a site for the Boston Red Sox spring training stadium and healthcare facilities. During the current growth spurt it has taken off as a mixed use development with most of the land being developed as rental housing units and smaller independent senior housing units and much of the land along Ben Hill Griffin being developed for retail. Over the last 5 years University Highlands has rapidly developed with over 300 units of rental housing in the Springs of Estero and the Springs at Gulf Coast and about 300 independent senior housing units in Tidewater by Del Webb. During the last 18 months the Village has reviewed or approved three commercial projects along the west side of Ben Hill Griffin Parkway that would utilize about 50% of the commercial property in University Highlands. They are: the Chase Bank, the University Highlands Mini-warehouse project in front of Tidewater and the Shoppes of University Highlands in front of Germaine Arena. Grande Oaks Shopping Center was started in the early 2000s with its Publix anchor and a several attached stores and a McDonalds and a Perkins on the corner. With the rapid growth of the nearby University and the residential growth to the east it began to filling in gradually. During the present growth spurt two additional projects have been approved and are nearing completion: the Dunkin Donuts/Valvoline project and the Heartland Dental project. When these projects are completed the Shopping Center will be built out and fully occupied. For those who live and work in Estero, these developments means more options, added convenience, and great news for the local economy. What’s more, as a result of these new businesses, the tax rolls in Estero have increased to a new high in 2018, totaling more than $6.5 billion. While building and growth are on the rise, Estero reflects the same dedication to our natural attributes, rich history, and vibrant people.